Poet’s Notes: “Blue Mosque” retells the memory of watching seagulls fly above the Blue Mosque in a trip to Istanbul I took a few years ago. Istanbul is a truly magnificent city—sincerely, the best city I have ever visited abroad—and the Blue Mosque is breathtakingly beautiful, especially at night (pictured). 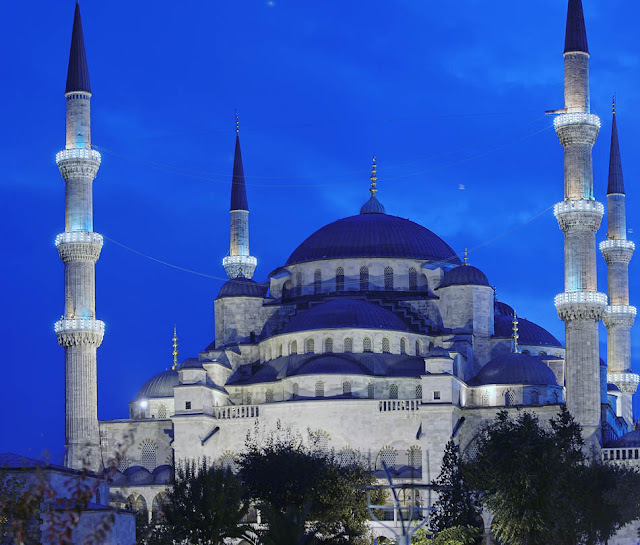 My first experience was, as in the poem, during the evening, and I can remember even now the exact image of the Blue Mosque as it appeared to me then. That sight directly inspired this poem. This poem was first penned briefly in the notebook I carried along with me on the trip when I got back to my hotel (which was mere steps from the Mosque), and so has its origin when the impression was fresh. I expanded and altered it years later (here in February, 2016) when I finally set to make this a published piece. Specifically, I decided to divide the poem so that the description of the seagulls represented a substantial "aside", which I think both captures the sense of the seagulls in flight—the physical movement of their soaring wings, uplift upon the currents of the air that night—and, through the division, how this sight drew my eyes away from, but then ultimately back to, the Blue Mosque. No doubt, this was the intention of lighting the Mosque at night—an effect that clearly left a lasting impression on me! The name of the Mosque in Turkish is Sultan Ahmet (Camii), and its inclusion represents the first time I've used Turkish in a poem. I like using foreign words at times in my poems, so I was pleased to be able to drop a bit of Turkish.